Pericardial calcification is usually associated with previous pericardial insult such as post-tuberculous or pyogenic pericarditis, uraemia, asbestosis, post-traumatic or postoperative cases. , Pericardial calcification may be associated with constrictive pericarditis , or may present as an isolated finding. However, acute intermittent porphyria (AIP) as a cause of pericardial calcification has not been reported. A 17-year-old female patient weighing 35 Kg presented to emergency department with history of chronic intermittent abdominal pain, vomiting, and anorexia for three months, history of recurrent generalized tonic clonic seizures for 2 days and history of rapidly progressive ascending type of limb weakness with respiratory distress for one day. She had no history of snakebite, pain chest, poison intake, or blunt injury to neck or abdomen. She initially presented to a private nursing home where she was intubated and transferred to our hospital on portable ventilator. On examination she was conscious (E 4 V T M 1 ) with power of 1/5 in all limbs, plantars were mute, and deep tendon reflexes were absent. Her heart rate was 120/min and blood pressure was 100/60 mm Hg. She was breathing at a set rate given by ventilator. Systemic examination was insignificant. She was transferred to intensive care unit with a diagnosis of acute inflammatory demyelinating polyneuropathy. She also had features suggestive of autonomic neuropathy in the form of postural hypotension, tachycardia, and sweating. Routine baseline workups including hemogram, blood sugars, liver and kidney function, chest X-ray, electrocardiography, electroencephalography were normal. Cerebrospinal fluid analysis was normal. Urine Watson-Schwartz test  was positive for porphobilinogen. Electrolyte screening showed mild hyponatremia (serum sodium 126 mmol/L). Serum phosphates and serum potassium were within normal limits. Ultrasonography of abdomen was unremarkable and serum lead levels were within normal limits. Nerve conduction study showed axonal motor neuropathy. She was treated as a case of AIP with high dose of carbohydrate (300-400gm/day), heme arginate (3 mg/kg/day for 4 days) and gabapentin for seizures control. Precautions were taken not to prescribe any porphyrogenic drugs. 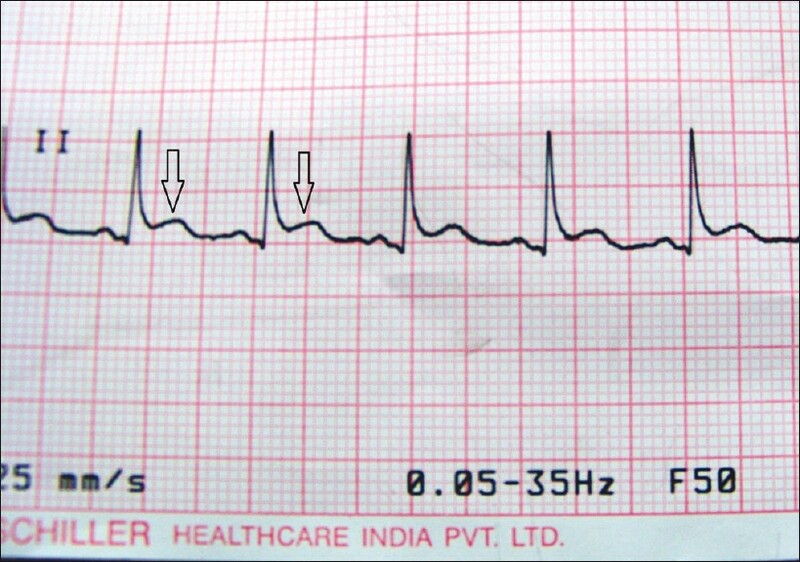 At 60 th day of her ICU stay ST segment elevation was noticed on the cardiac monitor and 12 lead ECG was ordered which showed [Figure 1] ST segment elevation in lead II. Cardiac enzyme markers were not elevated. Transthoracic echocardiography was done to rule out any cardiac pathology. 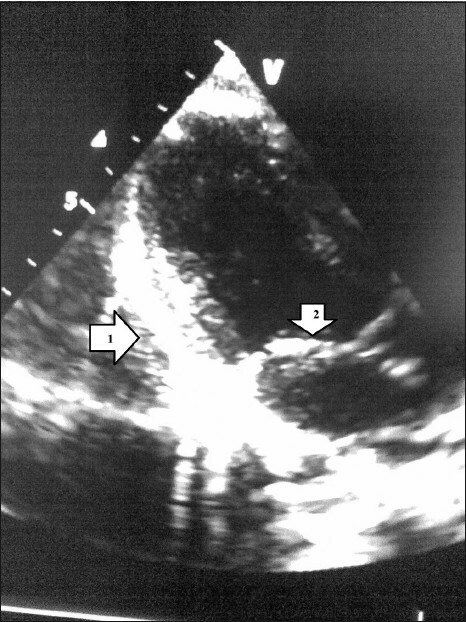 It showed posterior pericardial calcification with anterior mitral leaflet and papillary muscle calcification [Figure 2] and [Figure 3] and relaxation abnormality around mitral valve suggestive of early pericardial constriction. Serum calcium (10.8 mg/dl) and phosphorus levels (5 mg/dl) were within normal limits. Tracheal tube aspirate for acid-fast bacilli was negative for 3 days in continuation. Patient required prolonged ventilator support and was finally discharged with the advise to follow up. AIP is a rare autosomal dominant error of metabolism resulting from a disorder in the hepatic pathway of heme biosynthesis due to decrease of the enzyme uroporphyrinogen I synthetase. Complications of AIP may be neurological such as transient cortical blindness,  seizures, quadriplegia, and psychiatric disorders, may be autonomic such as tachycardia, tremor, hypertension, constipation, may be hypothalamic, endocrine and metabolic including hyponatremia, dyslipidaemia, glucose intolerance and hyperinsulinism and disturbances of haemostasis and fibrinolysis. Other long-term complications are chronic arterial hypertension, renal failure  and hepatocellular carcinoma. To the best of our knowledge and literature search, we could not find any report of AIP with pericardial or structural cardiac abnormalities. Calcifications of the pericardium may be present in the absence of constrictive pericarditis,  but, 27-50% of calcified pericardium is constricted. , Exact mechanism of the pericardial calcification is still not clear,  but is believed to be due to previous pericardial insult. Pericardial calcification usually occurs over the posterior part, i.e., right atrium and anterior right ventricle, diaphragmatic surface, atrioventricular grooves because fluid preferentially gravitates toward the right side of the heart, where calcium and even bone are slowly deposited in the inspissated fluid. In our case there was posterior pericardial calcification in echocardiography. 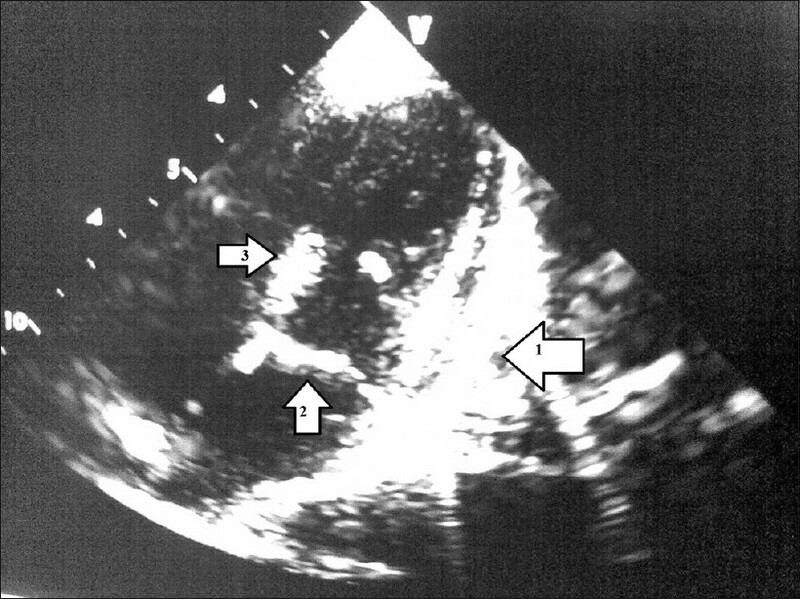 Echocardiography is the simplest and the most widely used technique for imaging the pericardium. Calcified pericardium will show a brighter echo than normal pericardium. Our patient is in a very early stage of constrictive pericarditis. As the patient was asymptomatic we had not started any conventional antifailure regime. This case report shows that cardiac calcification and constrictive pericarditis can occur as a complication of AIP. At present we cannot comment on the exact mechanism of the pericardial calcification. Deposition of porphyrin precursors in pericardial tissue may be responsible for the changes that result in calcification. Vasospastic mechanisms leading to pericardial injury in such patients cannot be excluded. 1. Raphael MJ, Donaldson RM. The pericardium. In: Sutton D, editor. Textbook of radiology and medical imaging. Edinburgh: Churchill Livingstone; 1992. p. 535-43. 2. Little WC, Freeman GL. Pericardial Disease. Circulation 2006;113:1622-32. 3. Ling LH, Oh JK, Breen JF, Schaff HV, Danielson GK, Mahoney DW, et al. Calcific Constrictive Pericarditis: Is it still with us? Ann Intern Med 2000;132:444-50. 4. Anderson KE, Bloomer JR, Bonkovsky HL, Kushner JP, Pierach CA, Pimstone NR, et al. Recommendations for the diagnosis and treatment of acute porphyria. Ann Intern Med 2005;142:439-50. 5. Meyer UA, Strand LJ, Doss M, Rees AC, Marver HS. Intermittent acute porphyria-demonstration of a genetic defect in porphobilinogen metabolism. N Engl J Med 1972;286:1277-82. 6. Kupferschmidt H, Bont A, Schnorf H, Landis T, Walter E, Peter J, et al. Transient cortical blindness and bioccipital brain lesions in two patients with acute intermittent porphyria. Ann Intern Med 1995;123:598-600. 7. Kauppinen R. Porphyrias. Lancet 2005;365:241-52. 8. Church SE, McColl KE, Moore MR, Youngs GR. Hypertension and renal impairment as complications of acute porphyria. Nephrol Dial Transplant 1992;7:986-90. 9. Onuki J, Teixeira PC, Medeiros MH, Di Mascio P. DNA damage induced by 5-aminolevulinic acid: A possible association with the development of hepatocellular carcinoma in acute intermittent porphyria patients. Quím Nova 2002;25:594-608. 10. Prashanth P. Armor heart in a 30 year old male: A case report. Heart Views 2007;8:106-8. 11. Chandy T, Vasudev SC, Rao GH. Changes in pericardial calcification due to antiplatelet agents: In vitro studies. Artif Organs 1998;22:666-71. 12. Bertog SC, Thambidorai SK, Parakh K, Schoenhagen P, Ozduran V, Houghtaling PL, et al. Constrictive pericarditis: Etiology and cause specific survival after pericardiectomy. J Am Coll Cardiol 2004;43:1445-52. 13. Gross BH, Glazer GM, Francis IR. CT of intracardiac and intrapericardial masses. AJR Am J Roentgenol 1983;140:903-7.